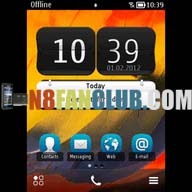 Symbian Belle Application launcher with 3 to 6 home screens. You can place shortcuts (including folders) and widgets on the home screens. N8 Fan Club. There is also a pull-down panel that allows quick access to the LED flashlight, Wi-Fi, Bluetooth and silent profile. The widgets include digital and analogue clock, calendar, contact and profile widget. You can arrange widgets at will. Note: This IS SYMBIAN BELLE Launcher, specially for those who want to stay on Anna OS, keeping in mind the bugs Belle OS has, and at the same time giving the look and feel of Symbian Belle OS to their Symbian Anna Smart Phones. N8 Fan Club. It just looks similar to Symbian Belle. Compatible with S^3 / Anna / Belle Smart Phones.